What’s On Your “Already There” List? Getting your life in order can be a daunting challenge, but it might help to take a few minutes and think about the progress you’ve already made — and the advantages you had to start with. Today, I’m encouraging you to make an “already there” list. That’s a list of goals you’ve already completed or head starts you had over most of us from the beginning. A simple, deliberate life includes less clutter and fewer distractions. Unhealthy eating habits have to go, and tactics to improve your health, your emotional state and your life in general have to start. But you’ve made some progress already, haven’t you? And you were a bit ahead of the game from the beginning, weren’t you? To what can you respond “I’m already there”? Here are a few of the things with which others struggle that I think I’ve conquered. Maybe my list will inspire you to make one of your own. 1. I don’t drink soft drinks. I was addicted to these concoctions of chemical-laden high-fructose corn syrup for years. I tried diet ones in college, but I didn’t see the point of having a bitter drink when I wanted a sweet one, so I returned to the ones with cups of sugar per two liter and drank more than a bottle a day. Several years ago — as a New Year’s resolution — I stopped drinking them in favor of unsweetened iced tea and water. I lost 40 pounds, then gained 10 pounds back. But I’m still 30 pounds lighter than when I was still allowing these nasty things to enter my body. 2. I’ve never paid for cable TV or satellite. For many families, pay TV costs more than $100 a month, but they’re home only a few hours a day and get no value for their money during all those hours the TV is off. When it’s on, they’re wasting away valuable time they could be using productively or for rest or meditation. Pay TV has no place in a simple, meaningful life. We pick up a couple dozen broadcast channels and have both a VCR and a DVD player hooked up to our one television. Along with all the media available on our two computers, that’s more than enough entertainment for two people. 3. We only have one car. Until a few months ago, we had two cars, but when the second one needed some major repairs (again), we sold it for a few hundred dollars and are managing fine with one. Neither of us have traditional jobs and we’re usually together anyway, so the second car was a waste of insurance and maintenance charges. Getting rid of our older car slashed household expenses, and it hasn’t had any negative impact on our lives. 4. We have a modest home. Our house is only 1,200 square feet. It is home to two people and four cats. It sits on an acre of land (too much) and there are some expenses related to it that aren’t minimal, but it’s not extravagant. We don’t have any really nice furniture, antiques or knickknacks. It still contains too many items, but there’s nothing frivolous or grand in it, and we like it this way. I could go on, but I don’t want to brag. Also, I haven’t thought of anything else yet. So that’s my list, off the top of my head. What’s yours? Consider writing one for your blog and putting a link below (and don’t forget to tell your blog readers where you got the idea!) — or post your list right here in the comments section. Join me in taking a minute to celebrate the ways in which we’re already there. Great post! I think about my list a lot but hadn’t thought to write it down. -Perfect 720 sq. ft. townhouse, interior walls painted in tropical blues and greens, garden out back. Dang! I am one fortunate girl! Hey good idea Gip. Sometimes, I put what I have already accomplished in the back mirror and don’t give enough credit to myself for how far I have come along. 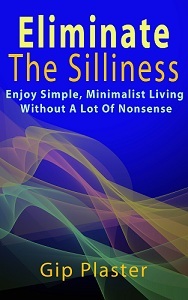 -Inspired some family members to ask their own selves if maybe they should simplify for more happiness. Whew! (Gives pat on back) haha. That feels to see the things I’m already there. Really cool exercises Gip! I think this might be something to do every now and again. If consistently going over our future goals is okay, so is celebrating the successful ones too – great idea. Thanks for participating, Reggie. If you feel inspired, put your list up on your blog — and don’t forget to tell everyone where the “already there” list idea came from. I’ll take the free publicity if I can get it! – 30lbs lighter than I was 10 years ago. – Good eating habits — not much processed food or soda. Good to have to here, Amy. I’m looking forward to seeing some more lists. They’re reminding me of other ways in which I’m already there. Maybe I’ll have to update mine. Will gladly do Gip. Nothing wrong with some free pub lol. Celebrating Your Successes « People, Not Stuff.